A non-profit international alliance of 45 organisations known as The Global Cassava Partnership for the 21st Century (GCP 21) is set to meet in June in Benin Republic to seek ways on how to help Nigerian farmers boost low cassava yield and create wealth for themselves as well as food security for the nation. Cassava is the main source of carbohydrates in Nigeria and other West African countries, replacing some traditional staples such as millet and yam. 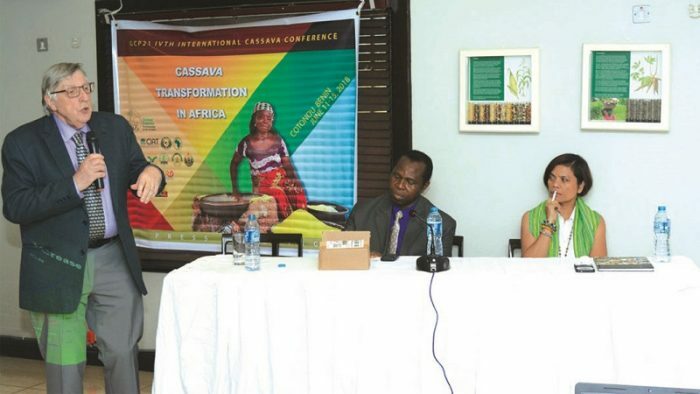 With its variability to dry climate and its applicability to many products including foods, confectionary, sweeteners, chips and pellets, experts say cassava has the capacity to help Nigeria become less reliant on food imports. According to GCP 21, West Africa produces 50% of world cassava. Nigeria by itself accounts for 20.2% of this output, making it the world’s largest producer of cassava. However, despite being the leading producer of cassava in the West African sub-region, experts say the country’s average yield per hectare is 10 to 15 tonnes, well below the world’s average. Speaking in Lagos recently, the Director, Global Cassava Partnership for the 21st Century (GCP 21), Dr. Claude Fauquet, said due to the archaic methods of cultivating it, Nigeria’s cassava yield per hectare remains one of the lowest in the world, having never been greater than 12 tonnes per hectare. He noted that Brazil, for example has the largest cassava yields at 50 tonnes per hectare. The scientist said that he had achieved 80 tonnes per hectare on his own. He blamed low plant yield and poor agronomy practices on the low yield. Fauquet said that Africa’s population would double by 2050, making it vitally important to find better ways of increasing the yield to support the population. “We need to mechanise the production of cassava to produce it in large quantity and make its price affordable to the large number of people, who consume it daily,” he said. He noted that cassava holds enormous potential as a food security crop, but to achieve thi, crop yields would have to be improved. Explaining further, he said farmers must have access to better-quality stems, fertilizer, mechanization, and maintain frequent weeding, right planting and harvesting times. The director adds that cassava could become the raw material base for an array of processed products that would increase demand for the tuber and contribute to agricultural transformation and economic growth in many sub-Saharan countries. He pointed out that the market for cassava in Nigeria and the rest of the sub-region is enormous and could still be explored further. Taking into account the numerous uses for fresh cassava, he projected the demand to reach 2.6 million tonnes. However, he warned that Nigeria and the rest of West Africa have a lot of work ahead to stimulate cassava production. He said that the average yield per hectare must increase to 30 tonnes nationwide to sustain the growing population which is expected to double in a few years. According to Farquet, mechanization of the cassava production is s pre-condition for industrialization. He said that there must be a concerted effort by the Federal Government, other international institutional and private sector to stimulate the improvement and transformation of fresh cassava through various agricultural-industrial projects. To help the sub-region achieve high cassava production to sustain the rising population, Farquet said GCP 21 is organizing its fourth international cassava conference in Cotonou, Benin, between 11th June and 15th. Top on the agenda of the conference is the need to enable farmers on the continent access technologies developed by international institutions for cassava production and processing. He added that prominent agricultural scientists and development specialists from around the world will assemble in Cotonou for five days to develop a plan and intervention programme to address production constraints. Professor Malachy Akoroda, who serves as the Director-Designate of GCP 21, said the group was set to collaborate with stakeholders globally to improve cassava yield. He added that partnerships and reviewing successes of other countries would ensure cassava sustainability and development. Akoroda noted that technological changes had influenced cassava production, allowing the possibility of offering better products, with increased value. He said that the use of the right technologies in farming will reduce time, increase productivity and address the limitations of small scale farmers. He called on stakeholders to collaborate to transform the industry.